North America's largest Jay, the Steller's Jay is also known as the loudest of its kind. Found high on the mountain slopes of the west, this bird lives its life much like its eastern relative, the Blue Jay. Both have a crest. Measuring 12 to 13 1/2 inches in length. The crest, back, and breast are blackish. The belly, wings and tail are deep blue. This birds call is a loud Shaack! Shaack! Shaack! May also mimic the screams of hawks. The habitat of this bird is coniferous forests consisting of pine and oak woods. Small groves and stands of mixed oak and redwood make up this birds home in northern California. Pairs are monogamous will stay all year together on their breeding territory. The nest is a sturdy cup of sticks and twigs lined with small roots, fibers and mud. Located 8 to 16 feet above ground, on a branch or in a crotch of a conifer. The female lays 2-6 eggs, usually 4. Incubation done by the female for about 16 days. The young will leave the nest in about 16 days after hatching. Young may be fed for 4 weeks after fledging. Near its nest site, it is silent and shy. Pairs breed from late March to early July, with peak in April and May. 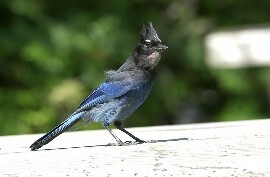 Steller's Jay eat nuts, seeds, fruits, and insects. Also known to feed on the eggs and young of other birds. Somewhat skittish in the woods, these birds quickly become accustomed to campsites and human providers often including human food in their diet. They will cache food in different parts of their territory. The Steller's Jay is often seen sitting quietly in treetops, surveying the surroundings. These birds can imitate sounds of other animals like cats and dogs.